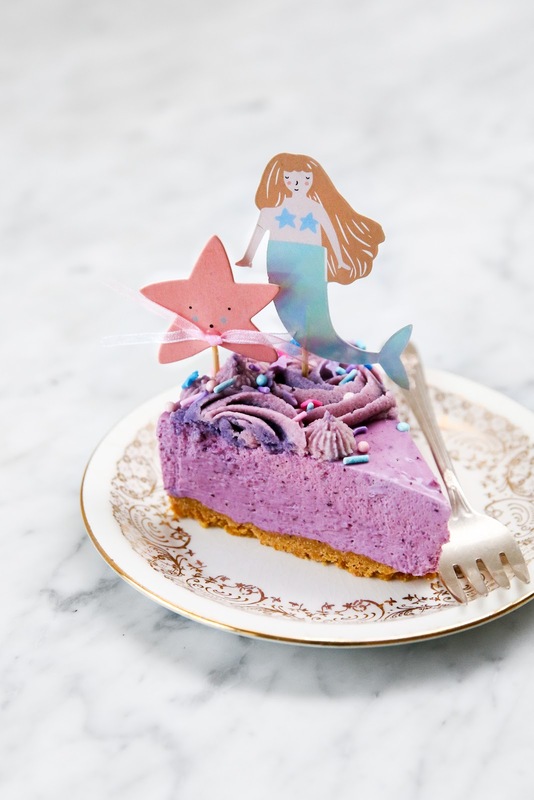 Mermaid No-Bake Blueberry Cheesecake + The Food Gays' New Book! I can't remember how I first met Adrian and Jeremy of The Food Gays, but I am sure it was the same way the most people find them — by find their colourful and seasonal dishes and inspired food styling on Instagram. When you meet Adrian and Jeremy in person, they are as wonderful as all the things they post and you become not only a subscriber but a friend right away. Whenever I see Adrian and Jeremy, they always encourage me to chase my blogging dreams and they are the perfect example of what happens when you put 110% into it. 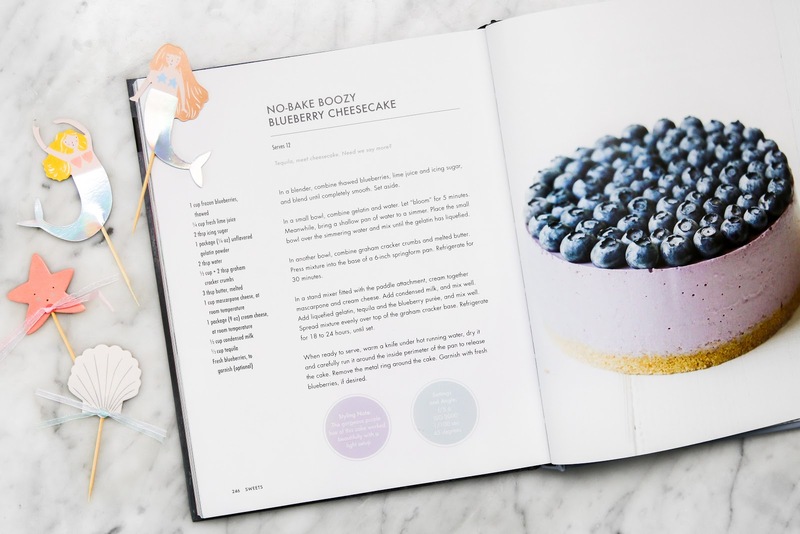 It has been so exciting to them turn an online collection of recipes into a physical hardcover cookbook. 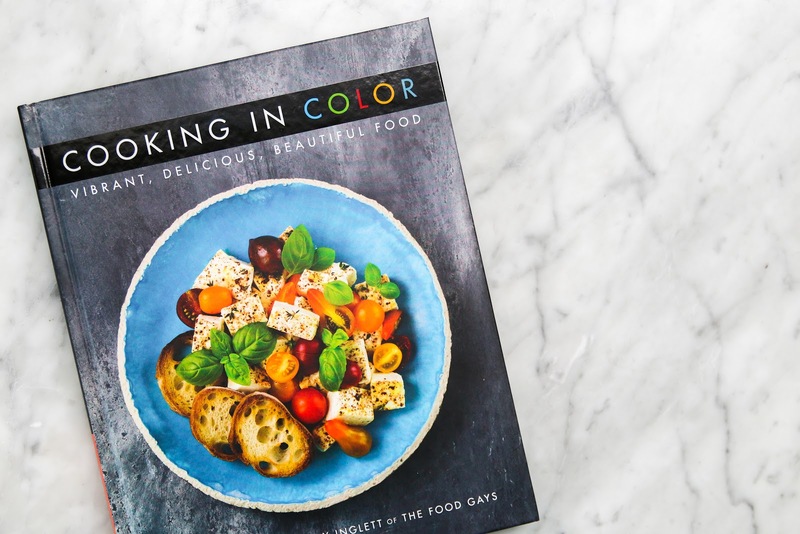 Cooking in Color was recently released and I am so happy to finally have this book in my hands. The book is not only a collection of colourful and easy-to-follow recipes, but also a great food photography guide. Adrian and Jeremy notes all the camera settings they used for each photo so you can learn the best settings to shoot different types of dishes. Among all the recipes, the one I knew I needed to make first was the boozy no-bake cheesecake. Even though summer came to an end not too long ago, it doesn’t mean the season of no-bake desserts is over. The cheesecake is a dreamy cream cheese, mascarpone, and condensed milk situation with a bright blueberry and lime purée mixed in. 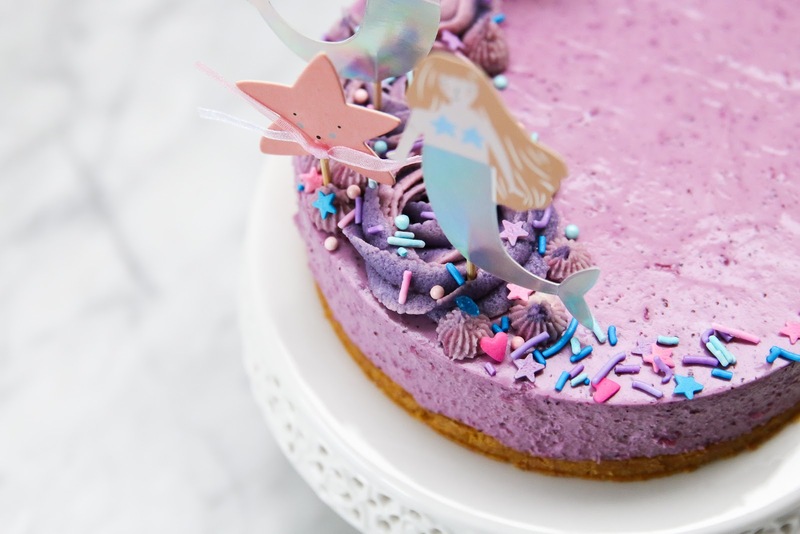 Both the blueberries and lime added a nice brightness to the cheesecake, not to mention a beautiful purple colour. The recipe calls for 1/3 cup of tequila so you know it is going to be a fun cake. Adrian and Jeremy kept it classic and placed fresh blueberries on top of the cake. I used wild blueberries for my cheesecake which gave it an extra vibrant purple colour. 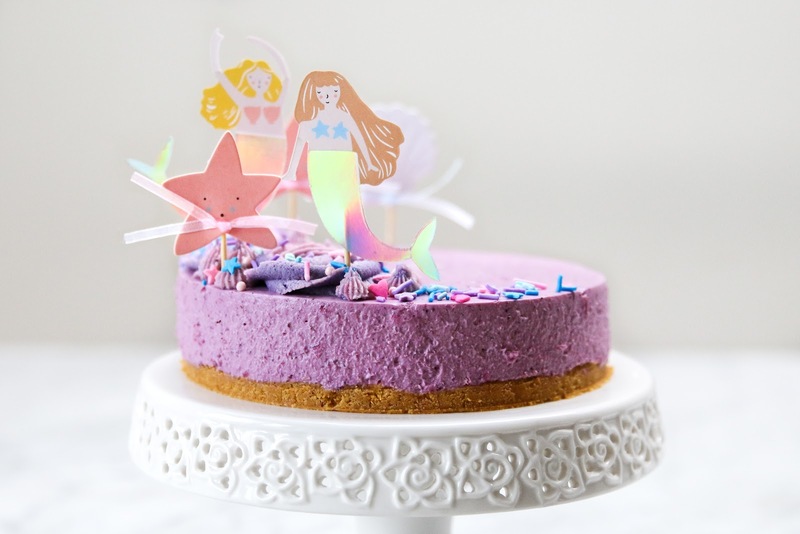 I had these mermaid cake toppers (hellooooo holographic tails!) that I was saving for something special and this cake was that special kind of cake I was saving them for. 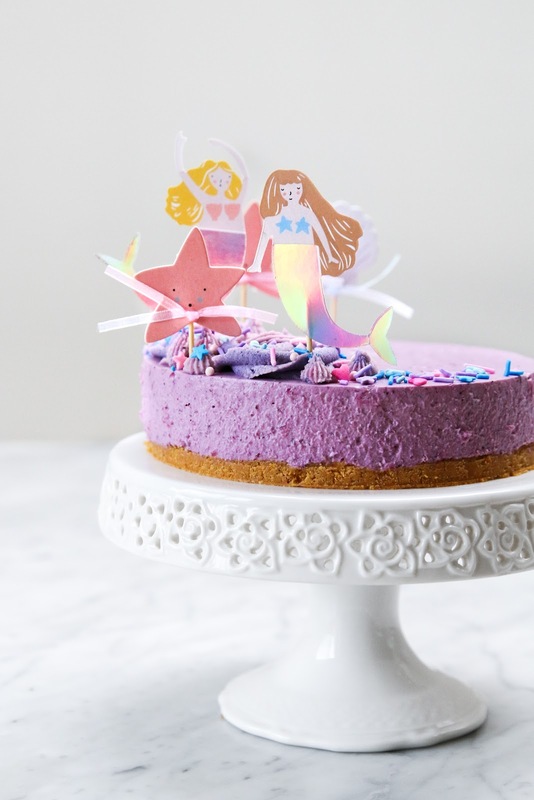 I piped some cream along one side of the cakes as 'waves' for my mermaid and topped the cake with some multi-coloured sprinkles for good measure. 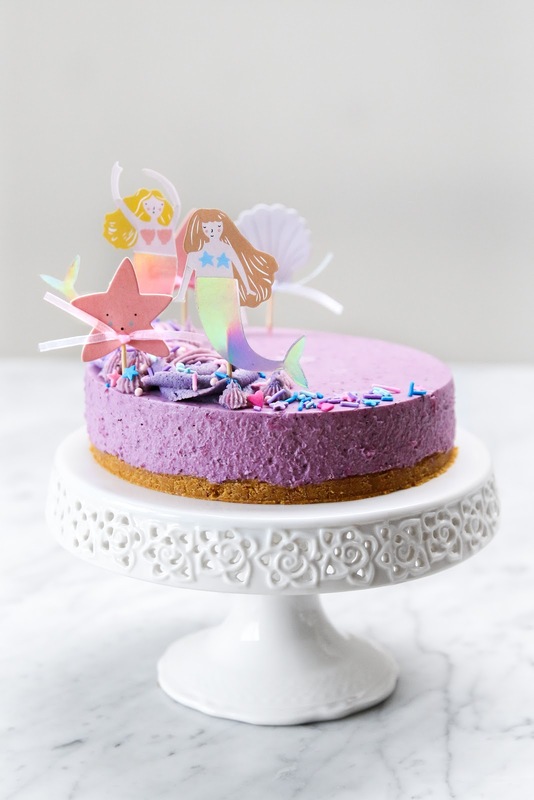 This no-bake cheesecake is the perfect canvas cake — it would be a lovely casual after-dinner dessert, Sunday morning treat, or birthday cake. In my case, this cheesecake was a celebratory cake because this cookbook is definitely something worth celebrating. Congratulations Adrian and Jeremy on your wonderful new book. I can’t wait to try out all the recipes. In a blender, combine thawed blueberries, lime juice, and icing sugar, and blend until smooth. Set aside. In a small bowl, combine gelatin and water. Let gelatin bloom for 5 minutes. Meanwhile, bring a shallow pan of water to a simmer. Place the small bowl over the simmering water and mix until gelatin has liquified. In another bowl, combine graham cracker crumbs and melted butter. Press mixture in the base of a 6-inch spring form pan. Refrigerate the base for 30 minutes until firm. In a stand mixer fitted with a paddle attachment, cream together mascarpone and cream cheese. Add condensed milk, and mix well. Add liquified gelatin, tequila, and blueberry purée, and mix well. Spread mixture evenly over top of the graham cracker base. Refrigerate for 18 - 24 hours until set. When ready to serve, run a knife under hot running water, dry it and carefully run it around the inside perimeter of the cake. Remove the metal ring around the cake. Garnish with fresh blueberries or cake toppers of choice. Thank you so much for sharing this recipe from our new cookbook #CookingInColor. Love the magical touches you’ve put on it. Food Photographer Dubai Thanks for the article post.Thanks Again. Cool.